I cook a lot (obviously! ), but can be a bit of a slacker when it comes to side dishes. Normally, I just throw some greens in a bowl, toss a little oil and vinegar their way, and call it a day. It’s a fine approach until I do make the effort to compose an actual vegetable side. When I finally do, I normally end up getting waaaay into it, hardly bothering with whatever the supposed main course is. This was the case with last night’s side dish. I made roasted Belgian endive dressed with walnut vinaigrette and I would have happily eaten the entire plate pictured above, all by myself. Just put me in a dimly lit dining room with a plate of that sweetly bitter roasted endive and a hunk of bread and you’d be looking at a very happy girl. And guess what! It really wasn’t more trouble than tossing together a quick salad, I just had to remember to turn my brain on when I was walking through the produce department at the grocery store. 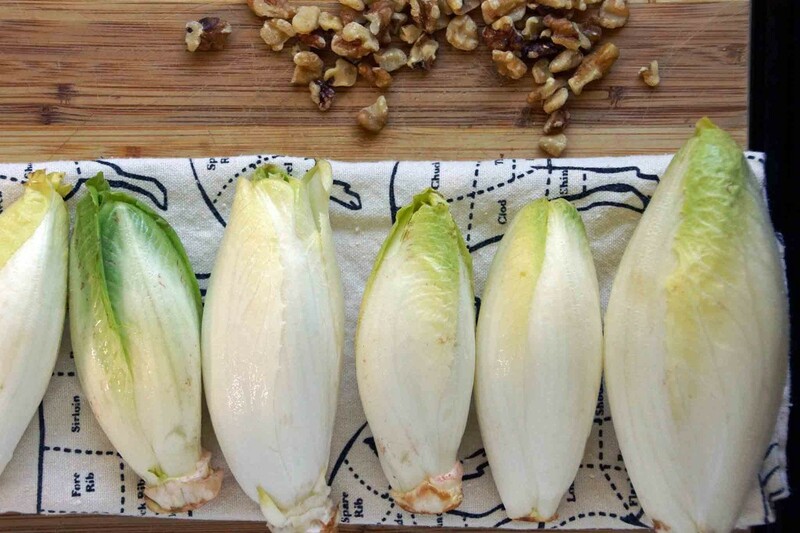 Just pick up a few Belgian endives and walnuts and you’re well on your way. Trim the bottom of each endive, then cut them in half. I love pretty vegetables. And some not-so-pretty ones, too. 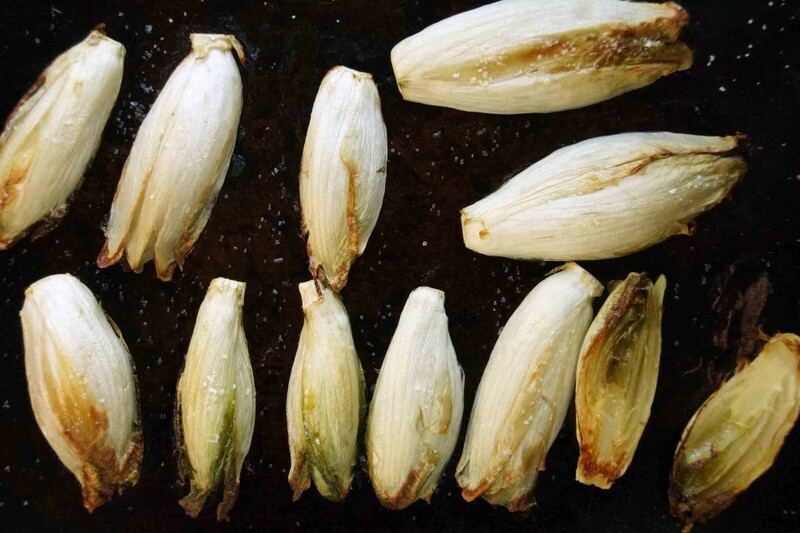 Drizzle the endive halves with a little olive oil and toss to coat. Sprinkle with salt them toss them in the oven to roast until they are tender and have started to caramelize. 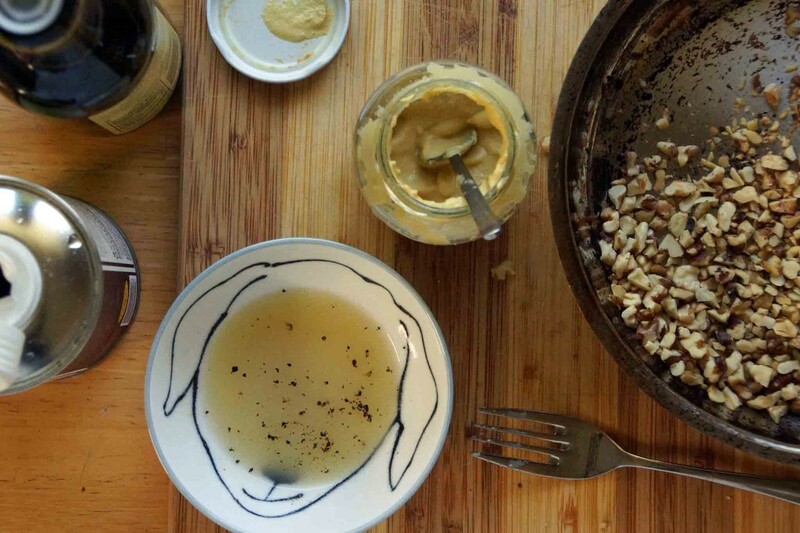 While that’s happening, you can mix up the walnut vinaigrette. Just combine white wine vinegar, Dijon mustard, and a pinch of sugar, then whisk in walnut oil. Stir in toasted walnut pieces, salt and pepper, and you have a rather addictive fall vinaigrette. 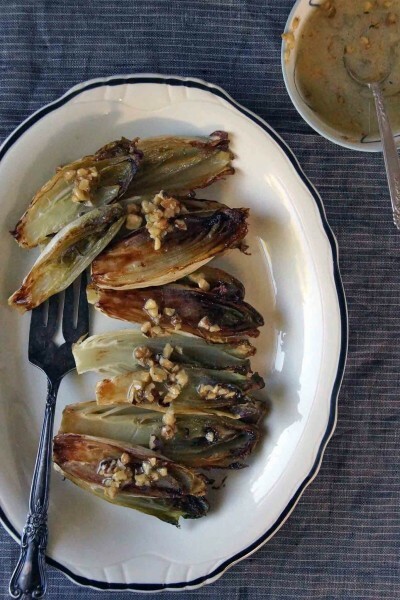 Arrange the roasted endive halves on a platter and spoon some of the walnut vinaigrette over the top. Eat, enjoy, and remind yourself to give your veggies the attention they deserve more often. The recipe will make more vinaigrette than needed for the suggested 6 endives. I used the leftover to dress a kale and sweet potato salad the next day. 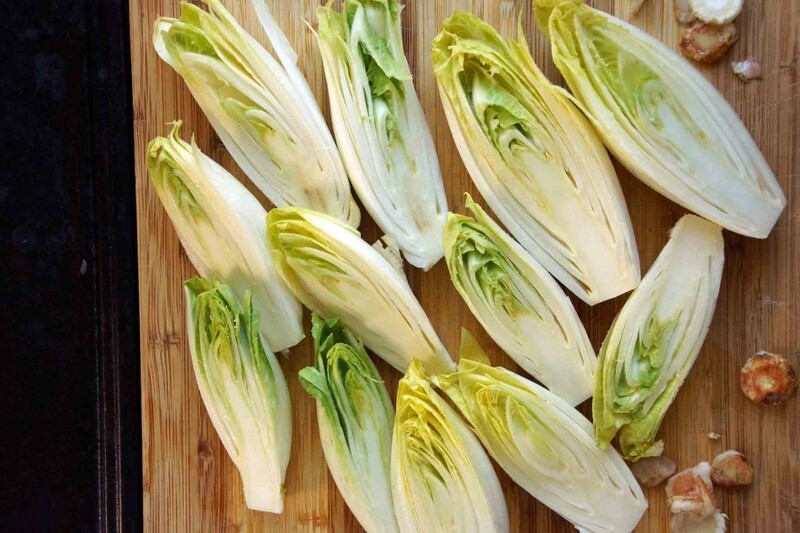 Trim the bottoms of the endive and cut each one in half, lengthwise. Place on a baking sheet, drizzle lightly with olive oil, and sprinkle with salt. Toss to evenly coat and arrange the endive cut-side down. Roast until tender and browned in spots, about 25 minutes. Meanwhile, make the vinaigrette. In a small bowl, whisk together the vinegar, mustard, and sugar. Slowly whisk in the olive oil, creating an emulsification. Stir in the toasted walnuts. Taste. Season with salt and pepper, to taste. 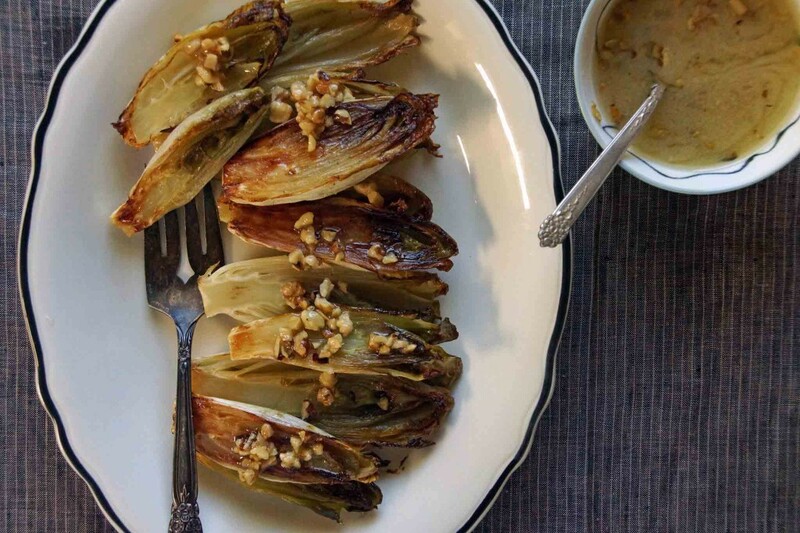 Transfer the roasted endive to a serving platter and spoon some of the vinaigrette over the top. Any remaining vinaigrette can be passed at the table or saved to dress a salad. These look delicious! I have to admit that I’ve never had endives before.But I like everything and that walnut vinaigrette looks perfect. This would be a good introduction to endive. Roasting them gets rid of (most of) the bitterness that’s a turn-off to some when they’re served raw.